S. Romi Mukherjee outlines human rights-based approaches to science, technology and development, and what they mean for policy and practice. A human rights-based approach to science, technology and development seeks to place a concern for human rights at the heart of how the international community engages with urgent global challenges. It entered the UN's lexicon in 1997, with Kofi Annan's call for human rights to be integrated into the UN's mandates, management, and methodologies for development and international cooperation. For science and technology, the approach requires scientists to go beyond knowing how their work relates to human rights, and demands that they strive to secure and affirm human rights through the knowledge they produce. For instance, a rights-based approach to virus studies — in potentially creating an ethical framework that guides research as it evolves — would not only push the frontiers of medicine and seek medical benefits, but actively guard against the potential to create new biological weapons. There is a question, here, of whether this is the responsibility of virologists (e.g. by contributing to dual-use debates) or the scientific community in general. A human rights perspective also affirms that access to scientific information is a human right (Article 27(1) of the Universal Declaration of Human Rights, see box 1). This implies that the benefits of scientific advancement should be shared openly, free from restrictions by social groups, corporate entities or states. Above all, a rights-based approach to science seeks to create the conditions for equitable participation in the global science community and fair access to scientific information and goods. In a general sense, a human rights-based approach recognises that science is a socially organised, human activity which is value-laden and shaped by organisational structures and procedures. It asks how governments and other stakeholders can create and implement policies to ensure safety, health and livelihoods; to include people's needs and priorities in development and environmental strategies; and to ensure they participate in decision-making that affects their lives and resources. Universal Declaration of Human Rights (article 27): affirms everyone's right to participate in and benefit from scientific advances, and be protected from scientific misuses. This Declaration encompasses issues such as pollution-free production, efficient resource use, biodiversity protection and brain drains. Monitoring is being reconsidered within a broader re-assessment of the 1974 Recommendation on the Status of Scientific Research. Governmental bodies and stakeholders concerned with the monitoring and implementation of the Declaration include COMEST, the UN Framework Convention on Climate Change (UNFCCC) and the International Council for Science (ICSU). The human rights-based approach is not without its critics. Indeed, a powerful critique comes from development theorists and policymakers in the global South, who emphasize the Eurocentric and Western origins of human rights and how they clash radically with non-European religious and social world views. Alternate thought systems, which often favour holism and community over 'self', call the approach into question, often viewing demands to recognise human rights as yet another strategy for subjugating citizens in the global South by imposing the 'human' and individual 'rights' onto cultures that struggle to recognise these notions. Should we, therefore, endorse an approach that is called into question by some of the very communities it is intended to benefit? While it undoubtedly comes from highly specific social and political contexts in 18th century Europe, it should not be lightly dismissed. It would be a mistake to assert, for example, that human rights campaigns have done little good in conflict zones, or to argue that Eurocentric roots cancel out their capacity for positive social change. Rather, the challenge is to explore how the human rights approach can help promote indigenous and local knowledge; how it can enable dialogue between competing beliefs where each claims to be universal; and how it can establish bridges between traditional and innovative forms of science and technology. In addition, science and technology can cause serious harm to the social and ecological systems on which life depends. Military technologies, for example, can be used to undermine liberty and justice; and new technologies, such as nanotechnology or geoengineering, may even call into question what it means to be human. Human rights approaches can shed light on the ethical implications of new technologies and examine how policy can keep up with rapidly developing science. On the other hand, science and technology also bolster development and even the fulfilment of human rights (box 2). This extends to information and communication technologies (ICTs) as tools that potentially facilitate access to scientific knowledge. ICTs are rapidly influencing democratic practice through e-government and social networks, for example. But the use of ICT tools can also be suppressed through censorship or under-development — leading to digital divides that bring new forms of exclusion. This illustrates how human rights approaches can support demands for fair and effective use of technologies such as ICTs. Another way in which science and technology intersect with human rights issues is the use of technologies such as geo-spatial, satellite imagery, and geographic positioning systems to identify and track human-rights violations. They offer access to remote parts of the world, providing both new information and a powerful way of communicating it for advocacy, policy debates or litigation. Amnesty International, for example, has created the Science for Human Rights Project where geo-spatial technologies are actively used to access conflict zones and gather visual evidence in novel ways. Amnesty's recent work in Syria, "Eyes on Syria"  illustrates the breadth of these technologies which can, with great precision, track unlawful executions, cases of torture and property destruction. But the bigger issue is whether, and how, a human rights-based approach should inform development ethics. Whose rights does the term refer to? Can the focus on individuals be adapted to the realities of development work at the community level? Human rights approaches to policy can have an impact on many areas of science, technology and development, including climate change, housing, energy production, deforestation, access to fresh water, biological warfare, surveillance, public health, and gender issues. They are also at the heart of debates about developing a 'green' global economy [box 3]. In this context, one fundamental principle of policymaking should be a focus on securing human rights, and clarification of the actions required of both rights-holders and duty-bearers to do so. In concrete terms, this requires both policy-makers and stakeholders to remain vigilant as to how the policy they construct redresses human vulnerability and inequality, while actively establishing mechanisms that thwart human rights abuse. At the national and geo-political level, a human rights-based approach might allow vulnerable groups greater authority in conversations over global policy; and it would impel policymakers to tackle those aspects of global economic and political power that create the conditions for human rights violations. To make policy and knowledge work, good practices are needed, and these must be assessed for their impact on, and implications for, policy objectives. The key here is to translate, mobilize, and evaluate the contribution of human rights-based approaches. The UN's human rights-based approach to programmes of development cooperation, policy and technical assistance uses a three-tiered approach that focuses on goals (realising rights), processes (standards and principles), and outcomes (increased capacity to meet obligations and claim rights). A Human Rights-Based Approach Development Planning Toolkit, developed with the support of various UN agencies, offers a reference for development planning — outlining the priorities to keep in mind in development work within the larger architecture of development projects. And it helps analyse progress in implementing human rights approaches. One of the tools offered is a table for detailing how people and groups may be affected or overlooked by a development project (figure 1). The toolkit attempts to firmly move the human rights-based approach away from abstract rulings and towards an analytic frame that can measure success. 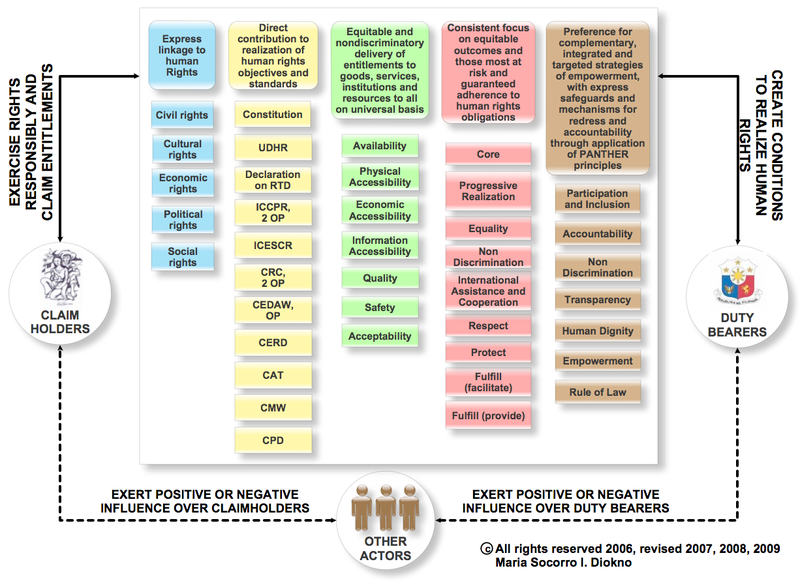 It is part of an approach to development planning (figure 2) that offers a series of principle-based guidelines that readily lend themselves to development projects, from inception to completion, while clearly illustrating how the international instruments discussed above (in Box 1) can be used to implement the human rights-based approach. An example of how this might work in practice is a study of advancing the right to water, sanitation, water infrastructure and water use, led by the UN Children's Fund (UNICEF) Lao PDR in collaboration with the Australian Agency for International Development (AusAID), the development charity Oxfam, and the Adventist Development and Relief Agency (ADRA). Researchers used a range of techniques, to examine the politics of water distribution and use in Laos, that fall under the rubric of human rights-based approaches, including: participatory monitoring and evaluation, community dialogues between provincial and district officials and villages, transparent bidding processes for water supply, and community user groups (which build village consensus on contribution rates, maintenance of water systems). However, these techniques are not exclusively human rights-based. Indeed, one of the great obstacles to developing good human rights-based practice is that the approach can encompass everything, thus risking being nothing at all. Also, consultation and dialogue do not necessarily guarantee consensus, let alone firm implementation. Certainly, science, technology, and development are central to the industrial and post-industrial revolution of the 21st century. And, even with their limitations, human rights are central to discussions on how science, technology, and development can promote human well-being. Human rights are also rights to sustainability, serving to protect the poor and vulnerable from the excesses of market-driven science and technology. Without a human rights approach to science, technology, and development, the uneven distribution of goods — from services and natural resources to intangible resources such as human dignity and autonomy — would only grow exacerbated, resulting in further environmental degradation and, above all, heightened vulnerability. In other words, human rights-based approaches should not be treated as merely decorative moral dimensions to policy or scientific and technological innovation. They can form the very heart of sustainable futures. S. Romi Mukherjee is senior lecturer in Political Theory and the History of Religions at the Paris Institute of Political Studies and visiting lecturer at the University of Chicago-Center in Paris, France. UNFPA. 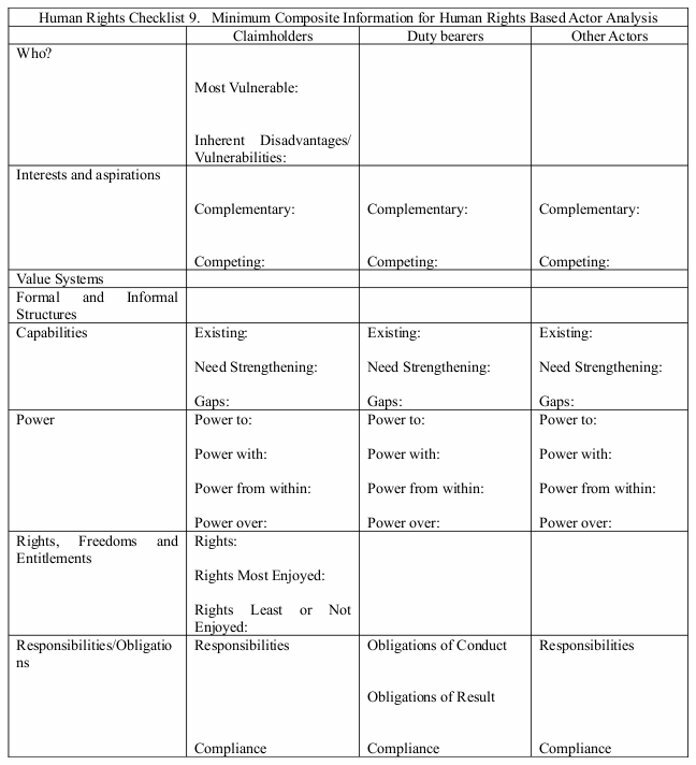 History and Definitions of the Human Rights-Based Approach [21kB] (2010). Claude, R. Science in Service of Human Rights, Philadelphia: University of Pennsylvania (2002), pp. 14–17.